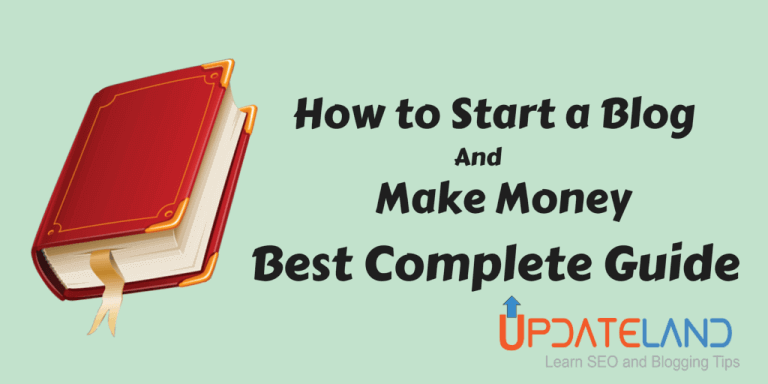 How to start a blog and make money is a common problem for several people. Who have heard from their friends, they are earning massive income from blogging. I have met with lots of people who give horrible reaction after hearing blogging word. But when I told them about my earning, they requested me to teach them blogging. Today I am going to share complete guide “how to start a blog and make money” at my lots of friend requests. First Part: How to Start a Blog? Take a look at how to update Name Servers? Second Part: How to make money with a blog? This guide is for those people who have decided to set up a successful blog but don’t know where to start. Since starting a blog is one thing and making it successful is another thing which demands lots of patience and hard works. I will share both methods in this guide. First method is those people who can’t afford huge money but have passion. Second method is those people who can buy hosting, themes and plugins mainly hosting. This guide is categorized into two main parts first how to start a blog and second make money blogging. To start a profession blog, you need a good domain name. To choose a best domain name take a look at this article by WPbeginner. If you have written above tips to select best domain, I hope you have find out a good domain name for you. Now time to buy domain name. I always use Godady and Bigrock to buy a domain name due to their good services. I would like to recommend to you same. afford money. So if you are looking for following questions, first method is for you. There are several platforms to start a free blog. But in this guide, I selected blogspot. Since it is more use friendly and I have personally tested it for my blog. A popup window will appear. Wrtie title in title option and blog name in address option. if blog name is not taken by anyone. It will show available. Otherwise you will see a alert Sorry, this blog address is not available. Try another name till you don’t see the message “this blog address is available” as seen in image. Select template from template option, don’t bother about it much. if you don’t know what is best for you. You can chage it later. Click on Create a new blog option. You have done 🙂 Now your dashboard will look like below image. Now time to do setting of blog to make it more professional. Click on your blog title option. Now you can see your blog dashboard like below image. Let me define each for better understanding. Overview: Overview option shows blog overview like page views, comments awaiting moderation, published comments, page views today, posts, followers etc. Post: Post option shows all post including published or draft post. It also shows post author name, view counts, and post publishing time. So every time when you want to edit any post or want to see which post are getting more views. Click on post and then click edit, view, share or delete options according to your requirement. Pages: Pages option is used create pages, edit pages and delete pages. All created pages are shown under Pages field. Comments: Comments options for managing comments. From this section, you can delete, approve or if you look something spam comments, simply click on spam. Automatically it will go into spam section. Google+: This option is used Google+ setting. Stats: It shows total overview of blog like page views, traffic sources and audience. Earnings: It is used to setup Adsense and earn money with blog. Campaign: This option is only for them who have good budget and want to drive traffic using Pay Per Click. Layout: it is important option to give a professional look to your blog. Blog layout provides you facility to add any gadgets into the sidebar, footer and header. You can simply drag up and down by clicking on gadget button. When you click on gadget option, you will see a window with basic, more gadgets and add your own options. In basic section, you will found +1 button gadget, Google+ Badge Gadget etc, every gadget shows description. So it is easy to select gadget what is best for you. Template: Template option is to edit and customize template. 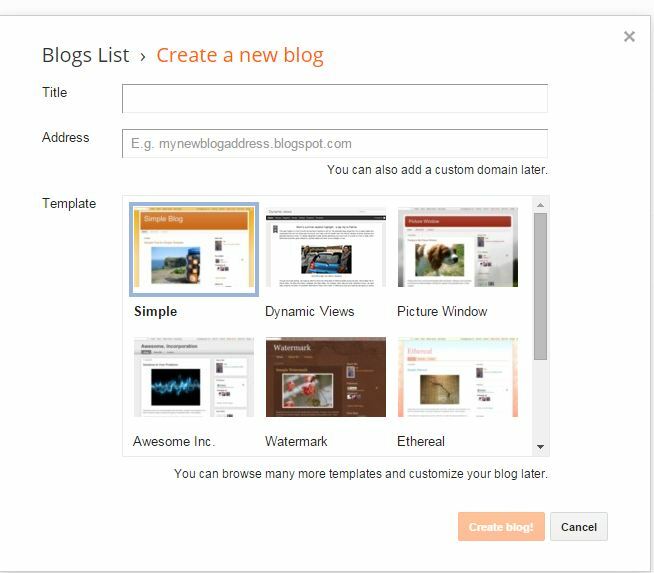 By default Blogspot offers 7 following sections of templates. You can select according to your blog theme. Using customize option, you can change anything like backgrounds, adjust widths, layout and advanced like below screen. You can select according to your requirement. If you want to change the background, select background option. Before make any changes in blogger, Take a backup of your blog. Read: How to take backup. Settings: Settings option include different subsection like basic, post and comments, mobile and others and search preference. Every name shows its function. In basic section, you can set title, description and authors. In post & comments section, you can set how many post will be shown at home page, comment moderation and word verification etc. I hope now you better understand with blog spot and can do all things like customization, creating pages and posts etc. Now time to set custom domain name for blogspot blog. If you buy domain name with Godaddy, Read the complete tutorial to setup custom domain name on Blogspot with GoDaddy. And in case of Bigrock, take a look at how to setup BigRock as custom domain for blogger. 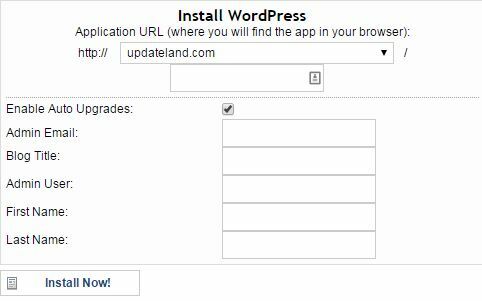 Completing above step, you will have a blog with a custom domain like www.updatelad.com. Mostly people love to start blog with WordPress since it is more user-friendly and SEO friendly also. Starting blog with WordPress you need to buy hosting. There are several companies who are offering hosting services. I personally use Hostgator. I would like also to recommend to go with Hostgator baby plan. Baby plan is best since if you plan to run more than one blog in future, you can manage lots of website easily if you take baby plan. But if your budget is less and you don’t want to run any website soon, go with hatching plan. This step by step guide is only for those users who have Hostgator hosting. When you buy hosting, you have get an email with all information like control panel URL, user name, 1st nameserver, 2nd nameserver and server IP. Visit control panel URL. You will see like below image. 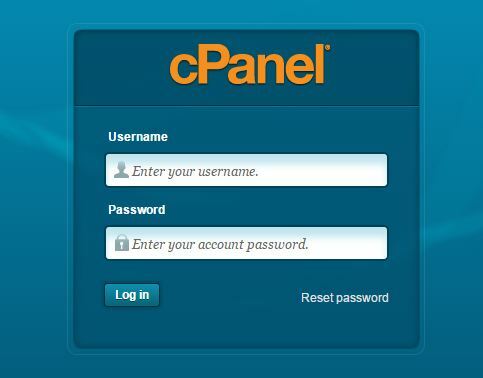 Fill username and password information and click on Log In button. Now select Addon Domains from domains section. After clicking on addon Domains option, you will have screen like below image. Put all required information like domain name, FTP username, document root, and password. After filling all info., click on Add domain name. Now you have created domain in control panel. You will see image like below. Now time to do WordPress installation. 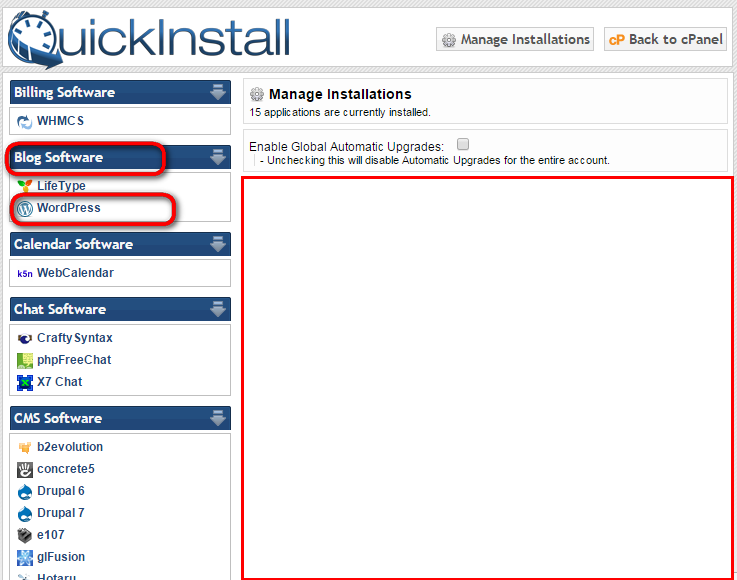 Click on QuickInstall option from Software/Services section. Now select WordPress Option from Blog Software section. Click on continue option and fill all required information. After filling all information, click on Install Now button. All done you will see like below image. This is one time password so change after login in WordPress. Now time to update nameserver. Now click on Domains option and again click Launch/Manage Option. New window will be appear, Now update Nameservers under nameserver section. You need to update with these nameservers which you have got into email from Hostgator. Nameserver Updation may take 24 hours to update. So don’t worry. As soon as name server updation effects, you will see WordPress default dashboard. Now time to install WordPress themes. If you have decided which theme is best for your blog and bought, follow the below instruction to install a WordPress theme. Visit https://www.updateland.com/wp-admin/, replace updateland.com with your own blog name. Now click on dashboard option. Again click on Appearance option and select Themes option. Now click on add new option. Click on Upload theme option and again click Choose file option. Select your theme from your computer. You have done. Every theme has different theme panel for setting so check theme demo content to set your theme. First part of this guide has been completed. Now time to move on second part make money blogging. You have setup blog successfully. Now time to establish blog in the blogosphere. To stand out a blog from the crowd or make it brand, you need to work passionately. I have divided this part into four categories. Content is the heart of your blog. Creating engaging and interesting content is an art. Are you thinking how you will know? What content will your reader enjoy?. Let me describe. People enjoy that content in which any problem is solved. You can simply ask from your reader what they want to read. You can write posts at that problems which you have faced in your blogging journey since most of bloggers face same problem like how to write killer headlines, best blogging community to make relationship with bloggers, best seo optimization tools, must have WordPress plugins etc. Crafting a perfect post is an art which develop after writing many posts, when I look my past blog post, I realize how many mistakes I have done in past. But Smart thing is that I have learned from my mistakes and you will also learn. Marketing is the main part of make money blogging. Your blogging income depends on your marketing strategy. Only writing content is not going to help you. You need to follow a proper strategy for marketing. Directory Submission: Directory submission is still an effective technique of link building. it provides permanent backlinks. Every directory submission site has own guidelines so always read guidelines before submitting your website. I shared a post before some days ago, in which I described directory submission guidelines and share a directory submission list also. Social Bookmarking: Social Bookmarking is best way to get instant backlinks for blog posts. It is helpful in fast indexing and driving traffic to site. Use only best sites like Reddit, StumbleUpon, delicious and Pinterest etc. Blog Commenting: I love blog commenting method as compared to another one. It gives double benefit. Double benefit means it helps to make relationship with blogger and creating backlink also. Is it not cool? Check below post to read blog commenting guidelines and get good blog commenting list. Forum Posting: Forums are sources to connect with targeted audience more than a technique of creating backlinks. Here is a list of top internet marketing forums especially for blogging niche bloggers. Steal Backlinks Sources from Competitor: it is a really cool technique, I hope you will also love this. First find out you top 10 competitors, check from where, they are creating backlinks. Conclusion, I have shared both ways first one how to create a blog with blogspot and make money, second how to start blog with WordPress and make money. If you have good budget, I would recommend to go with wordpress. Setting up a blog, follow second part how to make money with blog to earn passive income from you blog. if you follow all ways and work passionately, I am sure, you will be upcoming pro blogger. if you have any query regarding from blogging, feel free to ask via comment section. If you enjoyed this guide “How to Start a Blog And Make Money”, Please don’t forget to your followers. This is very helpful guide for newbies and also for old blogger. You covered all of method which help to make new blog and after it monetize it to make money. Many times, I got requests to share complete blogging guide and emails for how to start a blog so it is complicated to reply everyone with complete steps so i decide to write this guide for newcomers. just wow. A complete n detailed guide i have ever read,its pretty much useful for newbies and you have explained each points in detail. I used to see this kinda posts in shoutmeloud only but this post is better than any other posts on this same topic. Congrats miss.chauhan for writing such an useful post. I guess you might have spent many hours to complete it,one thing i want to ask how to make quality image for blog post? Means where to get free stock images,any light software to edit pics except photoshop ?? Hello Jyoti, Thanks for share your complete guideline with us. AS well, i am newcomer Blogger i am always searching for Blogging Guideline that will make a good carer for me as a Blogger. To be honest, By reading your this article, learn a lot’s of points. Today, i am following follow your these steps one by one . I am glad to know you found it useful for you and you are following one by one. 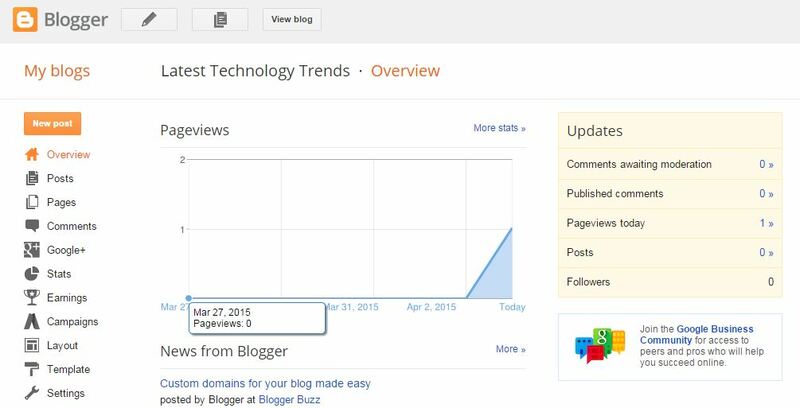 Keep coming and learn more bloging tips tricks. Wish you good luck for your blogging journey! care of by one of my friends. Welcome again at Updateland! I am glad you found it useful for yourself and bookmarked for future. Keep coming to learn more blogging tips. Nice and very informative article. I would like to know that ‘how i can improve CPC & CTR’. I have recently got the approval of AdSense. But did not make more money. I have written 50 plus article. Suggest any tips to improve CPC & CTR. Increase your blog traffic first, no. of articles doesn’t matter, know how many articles are ranking at first page of Google. Thanks for that very informative guide that will surely help new bloggers. There are several people who want to start blogging but don’t know from where to start. I shared this guide for newbie. I hope they will find it useful. Thanks to stopping by and leaving your feedback. Hello dear, Came to visit your site after I read your views on blogging tips. It is a pleasure to come to know about your site! Glad you found it helpful for you. Great post!! For any website, we need to know certain tips and you have shared tips on it.Thank you very much for discussing sharing interesting tips. I have already read so many comprehensive tutorials on starting a blog and earning money with it. So with this thought in mind when I tried to glance your post fast I could not have done so because of the quality of images and relevance of sub headings. So I gone through the whole post and especially your points with regard to Blogger blog and WordPress blog for offering full liberty to your readers to opt from the two platforms. Internal links in the post are also so relevant and do have much info in addition to this comprehensive tutorial. Thanks a lot for sharing this valuable resource. Nice to see you at Updateland again, I have write this guide especially for newbie who don’t know how to start blogging and after stating what to follow. I am glad you have gone through whole post. Thanks for stopping by and providing your feedback. I got this content as much helpful for me to create a solid and impressive blog………..thank you. Great idea this is really a valuable post. Well first of all I’d like to thank you for sharing such a wonderful and details guide on starting a blog and earning money from it. Well when I started my very first blog it was really heard to find all the necessary resources. But newbies can take good advantage from this post and start their first blog sooner. Every newbie face lots of problem since s/he don’t know how to start and from where to start. That’s why I wrote this guide. I hope they will find it useful. Today every body want to make some sort of income from the online source. But the idea of manking real money is know to only few. I think sharing such useful article is really going to benefit many such online bloggers who wish to make some money through blogging. I agreed with you everyone want to earn money online and can earn also only need to follow proper guides. I have got couples of questions how to make money starting a blog and finally I came with this. Thanks to stopping by and providing your feedback. Vivek, first you need to improve your website traffic. Can i know how much traffic you are getting currently. Yes, I have done very hard work to craft this blogging guide. Since I am getting many query everyday how to start a blog and earn money. it is very hard to job to define complete proceed in chat or phone so I decide to write complete guide. Now I easily send everyone to this guide. This article is written in very simple language and everything explained in very easy manner. Great Stuff. I think you can also give tutorials @youtube. Design this proper course in pdf format and then launch in all India with help of government Entrepreneurship institutes. This will give certificate and money both. If need any help, contact me anytime. This is an awesome article for a beginner. But I think if it is blogging for money, then it is always better to start a blog with self-hosted WordPress platform and target a profitable niche. What do you think? Thanks for sharing this …but actually already i started one year back Blog & seo but i did’nt get any money through adsense is not approved so how can i proceed? can you help me what the roles are applying to my blog? am waiting to your reply. Starting free blogs aren’t a bad idea, but they should be run as a side resource – more like micro blogging. Sites like tumbler are great for building an audience and it can help in bringing traffic to the main blog as well. Would like to see more posts from you, I see that you don’t post much these days? Jyoti, how are you doing today..? I hope you are doing well. I just went through your FB group and found you. I click on it and arrived here, on your blog. What’s amazing day is day…! I found an awesome blog post here. thanks for sharing.. Honestly, the above is really amazing for newbie bloggers to start their online business with blogging. Choosing domain and hosting service are the most important fundamental for getting start with blogging. You know..? When I first started my blog, I never knew about this. I did mistake with choosing wrong domain and hosting service. I’ve got a lot of problems at that time. Hence, I assumed that the above are really the most important and step by step guide. Thanks for sharing, I love additional information provided from your links. They are almost brilliant ideas.. This is really a good article and will help many new bloggers……. Thanks for full guide of make money with blogging this very helpful guide for newbies like me. Thanx for sharing this detailed article with us. I wanna just say awesome detailed article. Great Stuff. Many many thanks for sharing this very informative article. Jyoti,I would like to know that How can I make money with my blog at Jobsnexams which I have started in the year 2014 but still I have not got the approval of AdSense. Awaiting your reply. Thanks for such information. I wish to start blogging. I Need some more information. This is really so helpful for all bloggers especially newbie like me. you have explained all the required points in a very effective way. Good Article Jyothi, this article was written with so much information that even a newbie can pickup what you actually wanted to tell them about blogging. I too started my blogging career with blogspot and still I have it as one my sources of income. Hey thats really a nice guide, do you have your Ebook? Truly it’s Complete Guide. Thanks for sharing your genuine views and ideas. I would love to see some more post of NEWBIES struggling. I’d downloaded an eBook written by Neil Patel telling the method and procedure for having custom domain. But your way getting message across is more better than him I should say. Thanks for publishing great guidelines for initiator.even i learned so many things by reading a nice guidelines.I am fond of blogging but i couldnot get support till now.i hope u will support me. Hello jyoti, when I came acrosd the post I said wow wat a great! This type of complete guide I have never read before. As you said bloggigging givrs the passive income. And it is true the blogging industry is growing rapidly. But can you say it is a good career option? What a blog. I love this ………….. and the way you explain it. Many time people know it very well but didn’t able to explain it properly. Your simplicity make it simple to understand. Now I know that blogging can earn money…. Thanks …. Thanks Jyoti. Awesome post, starting a new blog is really easy after following this great post. Will surely forward this post to my newbie friends. Very nice blog. i am very happy to find your blog as i am new to blogging. Your article is a great help for new bloggers. A big thanks for sharing it. Hi Jyoti, I am planning to start a new blog and have been searching good articles on the internet for the same. In your article, you have given the insight of how to start a blog, it shows your research and dedication in gathering knowledge regarding this topic. Keep helping the new bloggers like me with more articles like this. Great article Jyoti. You should also cover “theme and plugin installation, menu and widget creation” in this article. It will help the newbies.